The students of CSUDH are still reacting to the shock from the presidential election on Nov. 8, which resulted in a Donald Trump electoral win. On- campus organizations like the Women of Color and Peace Club held a peaceful protest on Nov. 10 in collaboration with the Society of Independent Student Journalists, Black Student Union, Equality Club, Chicano/a Studies, Women’s Resource Center and the Office of Student Life. Waves of protest have spurred up throughout metropolitan cities like Chicago, New York, and Los Angeles, and the students at Dominguez Hills followed suit, using this protest as an opportunity to speak their minds and unload some long-carried baggage this election has packed. In an effort to ease the minds of many worried students, Alma Lopez, president of the Women of Color Club, came together with her members the day after the election to draft up a plan to bring students together for an Empowerment Walk. While Americans across the country turned to social media as an outlet to express their grief, organizations on campus decided to become proactive. The event brought students and faculty, some from marginalized groups and discriminated paths, together in solidarity. 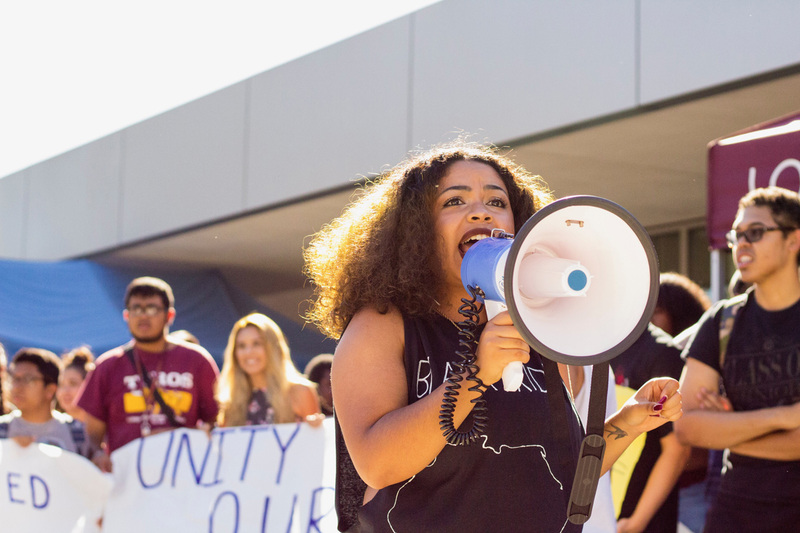 As CSUDH is one of the most diverse campuses in the Cal State system, there was a big turnout. About 300 students marched together to raise awareness and petition against the president-elect, Trump. The divisiveness of Trump’s campaign has put many people at odds and left people in fear for their rights. The groups targeted by Trump’s words and policies are now in a greater position of vulnerability. A large group of those present were protesting the president-elect’s threats to deport undocumented immigrants. The DACA stands for Deferred Action for Childhood Arrivals, which is a federal process that defers removal action of an individual for a specified number of years. While no one knows what actions Trump may take in the coming future, the protesters still expressed their legitimate fears, and made it known that they would not take discrimination lying down. This peaceful protest created a safe space for the students and faculty to come together and march through campus, as a message to everyone that the CSUDH community is still strong, no matter who the president may be.